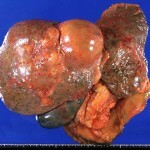 Hepatocellular carcinoma accounts for most liver cancers. This type of cancer occurs more often in men than women. It is usually seen in people ages 50 - 60. Patients with hepatitis B or C are at risk for liver cancer, even if they do not have cirrhosis. Some high-risk patients may get periodic blood tests and ultrasounds to see whether tumors are developing. Chemotherapy and radiation treatments are not usually effective. However, they may be used to shrink large tumors so that surgery has a greater chance of success. Sorafenib tosylate (Nexavar), an oral medicine that blocks tumor growth, is now approved for patients with advanced hepatocellular carcinoma. National Cancer Institute. Adult primary liver cancer treatment PDQ. Updated May 22, 2009. Roberts LR. Liver and biliary tract tumors. In: Goldman L, Ausiello D, eds. Cecil Medicine. 23rd ed. Philadelphia, Pa: Saunders Elsevier; 2007:Chap 206.